Marco Arment, known for Tumblr, Instapaper and (to a lesser degree) Nursing Clock, released his podcast app Overcast earlier today. 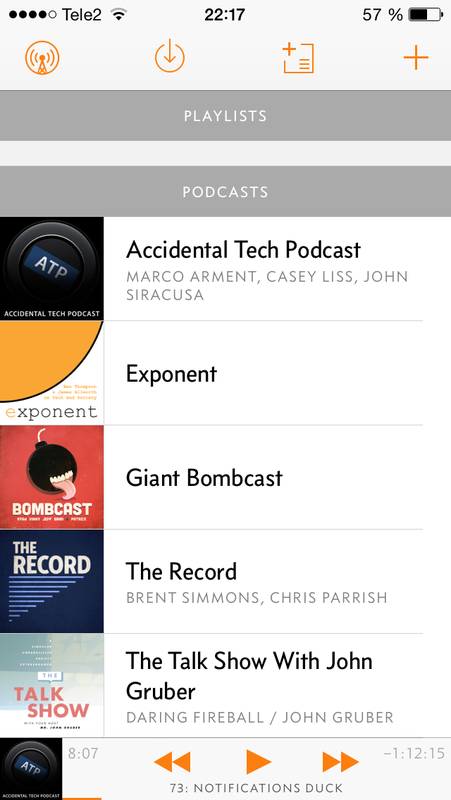 I’ve been following the development of Overcast through the tech podcast ATP which Marco Arment runs with Casey Liss and John Siracusa, so I was eager to give it a try. I’ve only used Overcast for a couple of hours, but I really like it so far. The two big selling points for me are Smart Speed and Voice Boost. Smart Speed dynamically shortens silences in podcasts, which sounds obtrusive but is handled nicely – I didn’t notice the difference while listening, but it ended up shaving off around ten percent of the podcast length. Voice Boost normalizes the volume of podcasts. Not as flashy as Smart Speed, but the difference was obvious when I compared listening to the same podcast on Overcast and other apps. Overcast also checks for new podcast episodes on the server-side, which is less demanding on battery life and allow the feeds to refresh quicker. Overall, Overcast is a very good-looking, snappy-feeling app with some really clever functionality. The one big missing feature is streaming, which is going to be added after iOS 8 has been released. If the lack of streaming isn’t a deal breaker, you really should give Overcast a try. It can be downloaded for free, and the premium features (including downloads over cellular) can be unlocked with a $4.99 IAP.